"The Colbert Report" host ribbed the former Democratic presidential candidate with some nifty one-liners. Stephen Colbert mocked the new mock-Romney, John Kerry. On the heels of the news that President Obama's re-election team has tapped Senator John Kerry to play the role of Mitt Romney in mock debates, Stephen Colbert opened Tuesday's edition of "The Colbert Report" by mocking John Kerry. "Obama has chosen John Kerry to play Mitt Romney. That is shocking. Somebody chose John Kerry for something." 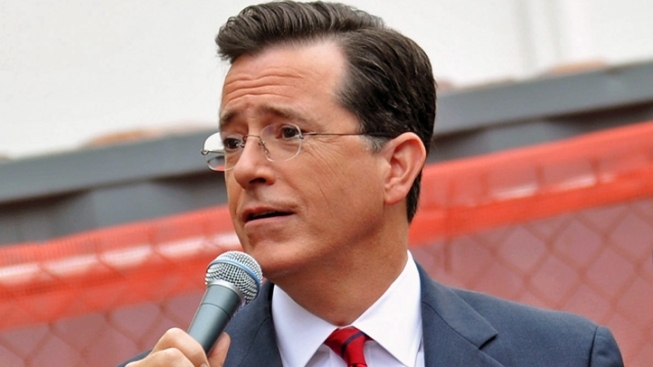 Colbert said that he eagerly awaits presidential debates—for a predictably outrageous reason, of course. "Every four years I play a little drinking game where I take a shot of bourbon as soon as the debates start and I don't stop until Election Day. I always win," he joked. When it comes to the faux-contest between Obama and Kerry, Colbert said, the choice is clear. "Now that I know John Kerry will be debating President Obama I have no choice but to throw my full support behind John Kerry. America, this is the man American needs to defeat Barack Obama. Who beater to face America's challenges than a man with so much face?"